Krause Gateway Center is the headquarters of the businesses of Krause Group, and is located in downtown Des Moines, Iowa. 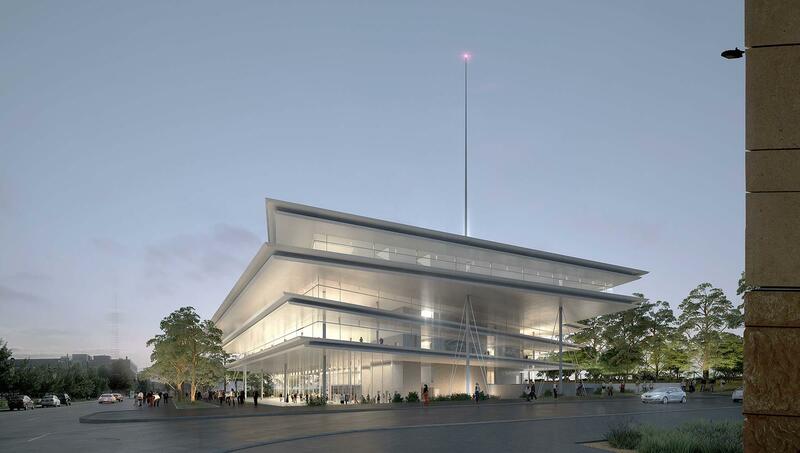 Designed by Pritzker Prize-winning architect Renzo Piano and his Renzo Piano Building Workshop, the building opens its doors to Krause Group associates in November 2018. Lightness, simplicity, and openness are the main concepts expressed in the design. The four vast planes flying over the site will emphasize the lightness and the transparency of the building and will dialogue with the sculpture park nearby. The building was designed to provide Krause Group associates a modern and highly collaborative work environment that offers flexibility for growth in the years to come. The five-story building is constructed for LEED certification, and features glass prominently on all sides to provide transparency and light throughout the building. The layout was designed to foster collaboration through innovative and unique use of space and light, including outdoor terraces available to Krause Group associates for flexible work areas. Massive roof overhangs provide both an artistic element to the building as well as a functional one by increasing energy efficiency. A “green” roof planted with native prairie grasses and flowers lessens the impact of energy usage and water run-off. In addition, the entire plaza surrounding the building is landscaped to serve as a natural extension of the celebrated John & Mary Pappajohn Sculpture Park located across the street. Initial planning for the project began in 2013 and RPBW was selected as architect in 2014. After breaking ground officially in October 2015, the project took three years to complete. In addition to the talented architects and designers at Renzo Piano Building Workshop, several notable firms (and hundreds of skilled trades workers) have been instrumental in the design, construction and finish of Krause Gateway Center. OPN Architects served as the local architect on the project, and have been critical partners in bringing RPBW's design to life. Ryan Companies US, Inc., is the general contractor. Krause Group is a family of businesses which includes Kum & Go, Solar Transport, the Des Moines Menace soccer team, and Italian wineries Vietti and Enrico Serafino, in addition to real estate and agriculture operations.